Homeschooling requires commitment and hard work! It will require you to spend time planning, preparing, and teaching. 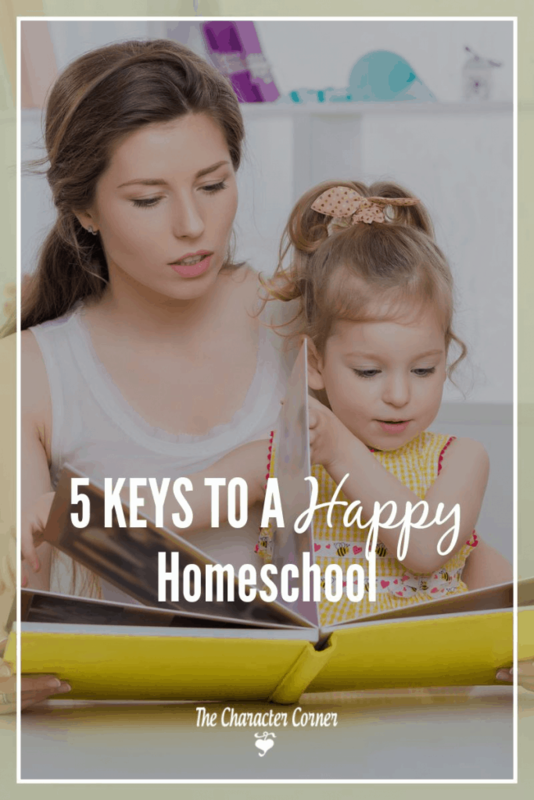 We need these keys to a happy homeschool, or we risk becoming stressed or overwhelmed. When this happens our homes and our home school often are no longer enjoyable. Mom isn’t very happy, and neither are the kids. 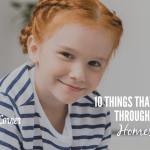 What are some simple ways to keep things happy in our home school? 1. Spend more time in God’s Word. Spending time in God’s Word give us wisdom and strength for the daily teaching and training of our kids. In order for us to point our kids to Christ, we have to KNOW Him. We have to spend time in His Word, listening as He speaks. When we love God’s Word and know it, we will naturally talk about it to our kids throughout the day. This in turn will give them a hunger and thirst for His Word. We don’t need more resources, more field trips, more activities; we need more of Jesus and His Word in our home school. He will guide us through His Word, and keep us focused on what really matters. That will lead to a peace and joy in our home school. One of our greatest goals in our parenting and homeschooling should be teaching God’s Word to our children. 2. Bathe your home school in prayer. God knows what each of our children need, and what He wants for them. We need to ASK Him! Seek God’s wisdom and direction, and pray regularly and consistently for those precious kids. Ask God to lead you as you home school. Commit your works and your kids to Him. This will take the pressure off of you, and put your focus on what God can and will do. God invites us to come to Him in prayers, and offers His help. Take advantage of that offer, and quit trying to do it on your own. In your own strength you will grow weary, and disheartened. Pray, because prayer makes a difference! 3. Choose curriculum that works for YOU. There are so many curriculum choices available, and making choices may at times seem overwhelming. Will it help our children learn to love God? Will it help our children learn to love learning? When the kids have strong character, they will work hard to do their work to the best of their ability. They will have the self-discipline to persevere even when it gets hard. They will do what they ought to because it is the right thing to do. It’s important to focus on obedience first. You can’t teach a child who hasn’t first learned to obey. If a child won’t stay in bed when he is told to, it’s not likely that he will sit down and do school work. Teach them to obey in small areas, and require it. When they learn to obey consistently and cheerfully, they are then ready for the academics. If on the other hand you let disobedience go until you are frustrated and angry, it will disrupt your home school and your family life. The post Ten Tips for First Time Obedience will help you if you are struggling in this area. If you’re not sure where to start with character training, check out Little Lads & Ladies of Virtue and Lads & Ladies of Wisdom. These are preschool and elementary character curriculum that only take 10-15 minutes a day to teach, and are fun for kids. It is hard to home school when you aren’t hardly ever home! If you really want to keep things happy and have less stress, limit your outside activities. When every hour of every day is booked, it stresses Mom and the kids. Usually too many outside activities cause you to neglect your priorities, and then you feel guilty. The kids feel stressed because they are behind in their work, or don’t get enough free time to just play and be kids. I’m not saying to not have ANY outside activities. I am saying to choose wisely. Ask yourself if the activity is worth the time away from other things you might be doing, and if it is beneficial in meeting your goals of homeschooling. 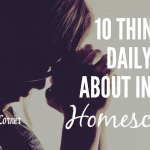 Time will always be at a premium for homeschooling moms, so we have to be careful in how we choose to spend that time. If you’re not enjoying your home school, or your kids aren’t happy, try implementing some of these simple keys! 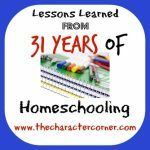 WISHING YOU HAD A VETERAN HOMESCHOOLER TO MENTOR YOU, OR A PERSON THAT YOU COULD GET LOTS OF ADVICE FROM THAT HAS HOMESCHOOLED FOR THREE DECADES?